With about a month left in the NBA regular season, the race for the Atlantic Division title appears as if it is going down to the wire. The Knicks, Nets and Celtics are currently only separated by 3.5 games in the standings, with New York holding a razor thin margin after comfortably leading the division for months. Injuries and age have caught up to the Knicks in a big way since their torrid start, with a fairly pedestrian 18-17 record since January 1st. Despite Amar’e Stoudemire’s successful transition to the bench, New York has often had trouble scoring since the New Year rolled around, and Carmelo Anthony’s amazingly efficient start is well in the rear-view mirror. Still, the Knicks built up enough of a cushion in the first months of the season to remain in first place, even if their hold on the division is now tenuous at best. After suffering through an abysmal start of the season that saw coach Avery Johnson getting fired, the Brooklyn Nets have bounced back in a big way under interim coach P.J. Carlesimo. 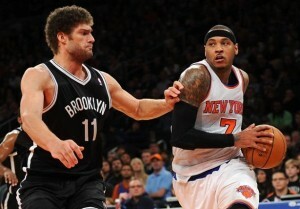 The Nets are 25-14 since Johnson’s dismissal, and are currently within one game of the Knicks in the Atlantic. Brook Lopez’s consistency earned him his first All-Star appearance, while Deron Williams in particular seems to have rebounded from a brutal first half to resemble the player Brooklyn gave a max contract to over the summer. The Celtics rise from the ashes has been even more dramatic. It is pretty remarkable that Boston is even in position to challenge for the division title, considering where they were several months ago. The Celtics were sitting with a 20-23 record and had just lost Rajon Rondo for the rest of the season with a torn ACL, and few gave the C’s any chance of squeaking into the playoffs. Since Rondo’s injury, Boston sports a 16-7 record, and looks like it could be a dangerous spoiler team in the playoffs. With so little ground separating the three teams, every game for the rest of the season takes on added importance, so expect an entertaining battle the last few weeks of the regular season.